This year, Hanukkah begins sunset on Tuesday, December 12th until sunset of December 20th. It’s an 8 day celebration filled with traditions for festival of lights, lighting the menorah and to playing the dreidel game. The dreidel game is much more than just a game…it combines math, fractions, probability and of course fun! Wait can anyone play?! Of course it doesn’t matter what background anyone can play! Let’s first start off with what is a dreidel and how the game works. 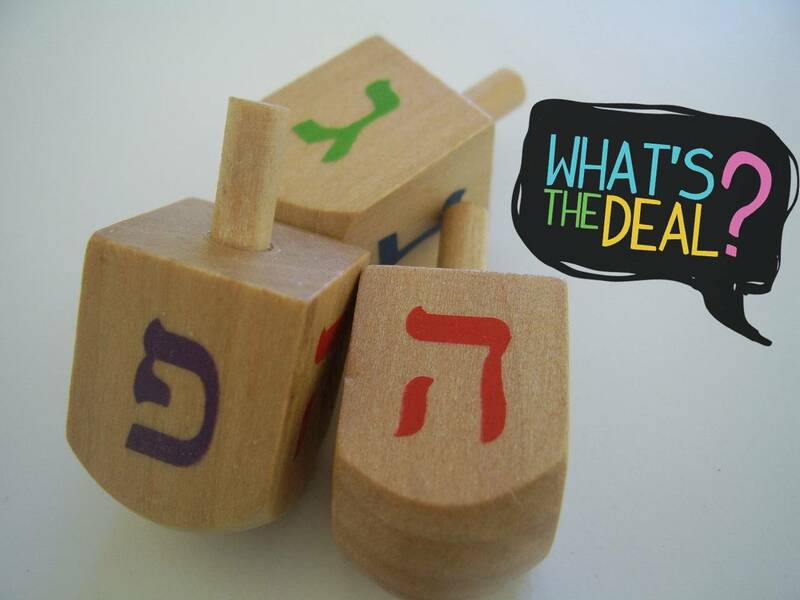 Dreidel is Yiddish for “spinning top” or “to turn around”. A dreidel has 4 sides with 4 Hebrew letters... Nun, Gimel, Hey, and Shin. An acronym for “Nes Gadol Hayah Sham” meaning “a great miracle happened here” (referring to events recorded in the ancient Hebrew books of First and Second Maccabees…. But that’s another story). We first have to start with a “fair dreidel” (AKA - don’t buy a cheap one!) The dreidel needs to be perfectly balanced around the center of mass so that it doesn’t favor one side over the others. Any number of players can play so invite your whole family and friends! We begin with everyone putting an ante (or a certain number of coins or candy) into the pot. Your currency can be buttons, candies, marbles, chocolate coins (gelt) or even real money. It’s basically whatever you fancy…I, personally, play for candy. Everyone starts with the same amount of currency, then each player takes turns spinning the dreidel. Whatever it lands on determines the action of the player. Nun – Do nothing… NUNthing happens… You are safe. Gimmel- Take the entire pot! GIMMEL (gimme) the entire pot. Hey- Take half the pot, HEY it’s better than nothing. You have a 1 in 4 probability of spinning any one of the letters.Say you start by getting a Shin… you have to pay. What are the chances that you’ll get a Shin on your next turn? Still 1 in 4, or 25%! Even though your previous spin has no impact on your next one, the probability of spinning the same thing several times in a row does get smaller. To find the probability of spinning the same thing back to back, you take the probability of the single event (like, 1 in 4 of rolling a shin) and multiply it by itself. The probability of rolling 3 shins in a row would be ¼ x ¼ x ¼ … or, 1/64 – not very likely, but definitely possible! Sorry for ya! The game is over when one person has the entire pot OR it’s over whenever you say it is. It’s like RISK and Monopoly the game may never end!